Several years after graduating from MTSU, Jessica wondered how she would use her music industry degree in the “real world” as she taught students of all ages how to play plastic ukuleles and wrote songs structured around wicked kazoo breaks. Shawna, only 20 miles away, was stuck re-working solo fiddle breaks that seemed broken and staring at partially written songs. 10 miles in the other direction, Meade cut biscuit dough with a jar lid – consoling herself and battling her aversion for the things she should want at this stage in life: another degree and/or a permanent position in the second violin section of the local symphony. One night in July 2012, a connection was made that would forever change Jessica, Shawna, and Meade. Jessica played a string of major 7th chords on her National, as the eager listeners gazed on. Shawna and Meade exchanged glances, and at the close of the song, names. Most of the guests left the house concert around 11:00 p.m., determined to get 8 hours of shuteye before returning to their day jobs, but not Shawna or Meade (along with a few other musicians). Shawna ingenuously picked up her fiddle, Meade clumsily grabbed a bass (sort of like a violin, only backwards, right? ), and Jessica tuned her banjo (for a really long time). Something super unexpected filled the living room: music. It is now 2013, and Shawna, Jessica, and Meade are still playing together. When they’re not playing in public venues, you can often find them playing on a porch in North Knoxville. If you want to know what these girls sound like, come to a show. 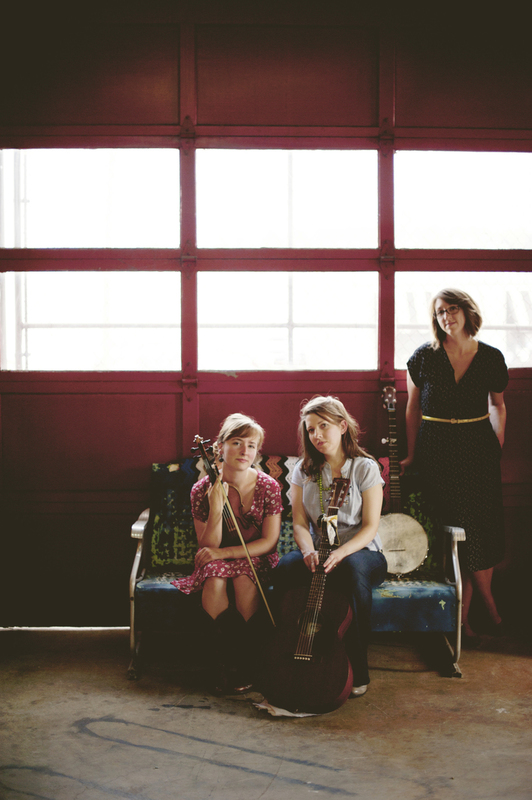 If you want an excuse for a band description, here it is: Red Shoes & Rosin is a string band hailing from Knoxville, TN. RSAR can be categorized as (but is not limited to) folk, country, americana, and/or alternative.